These pesto puffs push all the right buttons when you want a tasty savoury bite. They’re quick to make, deliciously moreish and can be devoured in one or two mouthfuls. 1 Cut pastry into 24 small rounds with a 5-5.5cm (about 2”) cutter. Slip pastry rounds into a tartlet tray (as a guide holes should be approximately 4-4.5cm 1½-1¾” diameter and 2cm/¾“ deep). Prick the bases with a fork. Chill. If pastry sticks in your tartlet tin, see notes below. 2 Preheat oven to 190°C (375°F). Prepare basil leaves as described below. Put basil and garlic in the bowl of a food processor and whiz until basil is very finely chopped. Add pine nuts, whiz again briefly, then add oil and salt and give a final whiz until a coarse purée. Transfer to a bowl and stir in parmesan and sour cream. 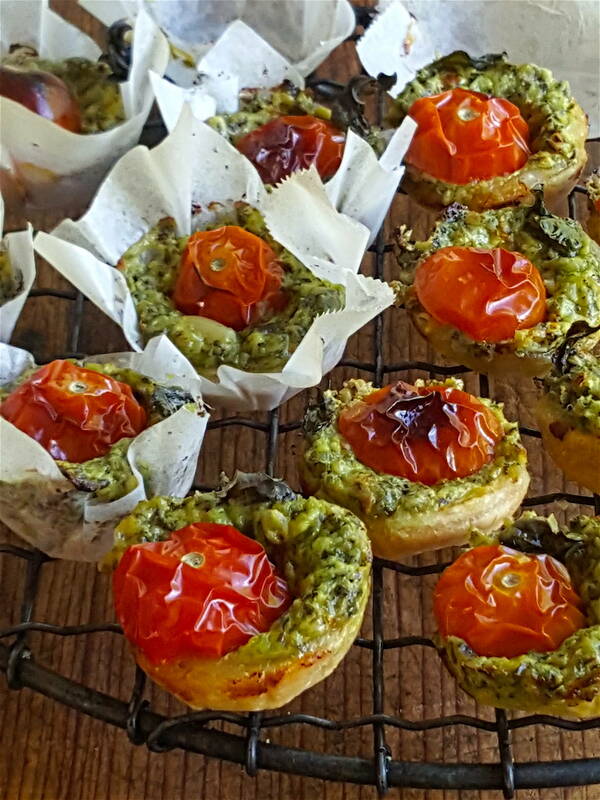 3 Fill tartlet bases with pesto cream and put a halved cherry tomato in each, placing cut side down. Add a small basil leaf to each tartlet. Bake for about 15 minutes, until puffed on top and golden on the bottom. 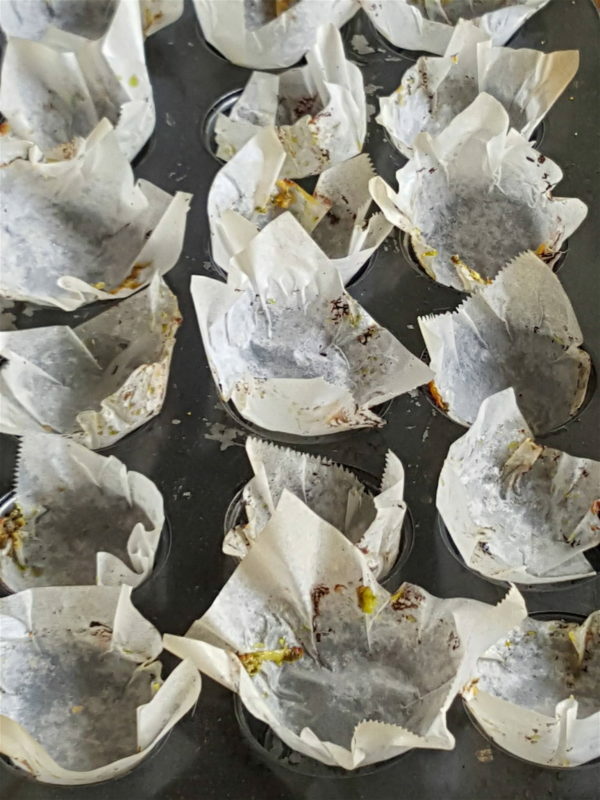 Carefully remove from tartlet tray (easily done if the tartlets are lined with baking paper as described below) and cool for several minutes (the tomato will be piping hot) before serving. For a greener pesto, blanch the basil leaves before removing them from the stems. Have a bowl of iced water at the ready. Plunge basil leaves into a saucepan of gently boiling water, count to 10, scoop leaves out with a strainer and put them straight into the icy water. As soon as the leaves are cool (a matter of seconds), remove from iced water, drain, then lay them on paper towels and gently pat dry before continuing with the recipe.